Video shot by the Monmouth County Sheriff's Office shows a couple getting married inside a courthouse restroom. 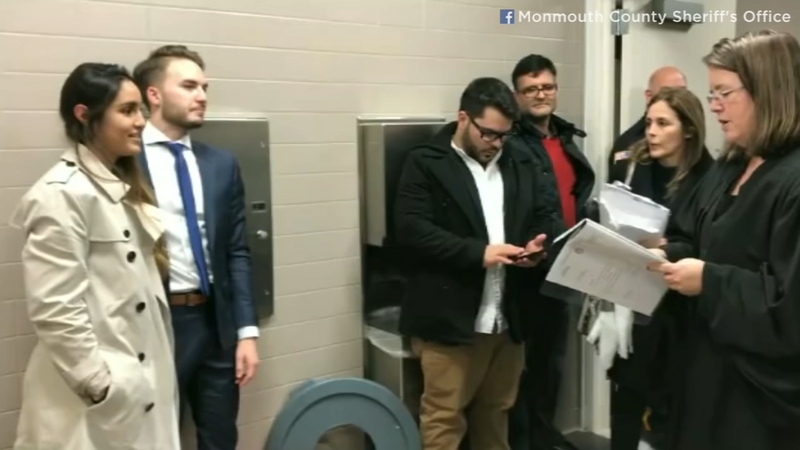 FREEHOLD, New Jersey -- A wedding ceremony in New Jersey took a bizarre turn when the ceremony was suddenly moved to the courthouse bathroom. Brian and Maria Schulz, of Ocean Township, were all set to tie the knot at the Monmouth County Courthouse on January 2. The ceremony was underway when the situation got tense. The groom's mother started having trouble breathing and had the feeling of an asthma attack. Sheriff's officers rushed over to help, taking her to the women's restroom where they started giving her oxygen while waiting for EMTs to come help. The couple was upset about both the sudden illness and the possibility that they wouldn't tie the knot that day. If the ceremony didn't happen right then, they'd have to wait 45 days for a new marriage license to be processed. The wedding couldn't go on without the groom's mother, either. She signed the marriage license and had to be there for the ceremony. Moving the groom's mother wasn't an option -- the officers were concerned it could cause her situation to get worse. That's when one of the officers suggested that they continue the marriage ceremony in the women's restroom. The couple accepted the suggestion and the venue was officially moved. Honorable Judge Katie Gummer performed the ceremony in the most unusual confines. The wedding, held near the paper towel dispenser - was captured on a cellphone camera. You can even hear the "hissing" noise from the oxygen tank. The newlyweds are doing just fine, and so is the groom's mom. The couple is extremely grateful for the officers' quick actions, and for everyone at the courthouse making accommodations under those circumstances. "I commend the sheriff's officers and EMTs involved in ensuring the safety and wellbeing of the groom's mother," Sheriff Shaun Golden said. "As for the nuptials, the quick thinking and determination of our officers and commitment from the judge to perform the ceremony in unusual circumstances led to one happy couple. I congratulate them both and wish the mother continued health."